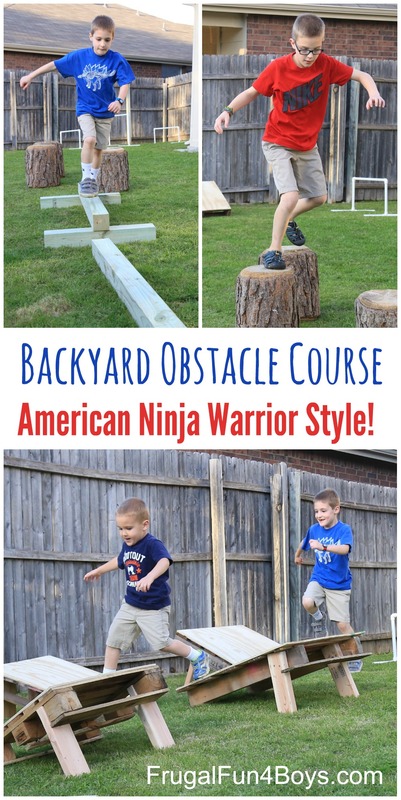 This American Ninja Warrior style back yard obstacle course has been a huge hit with our boys and with the neighbor kids too! I knew that the boys would like this, but I underestimated just how much they would LOVE it! They have been setting up obstacle courses and then doing them over and over and over. Just the active play outlet that we needed! 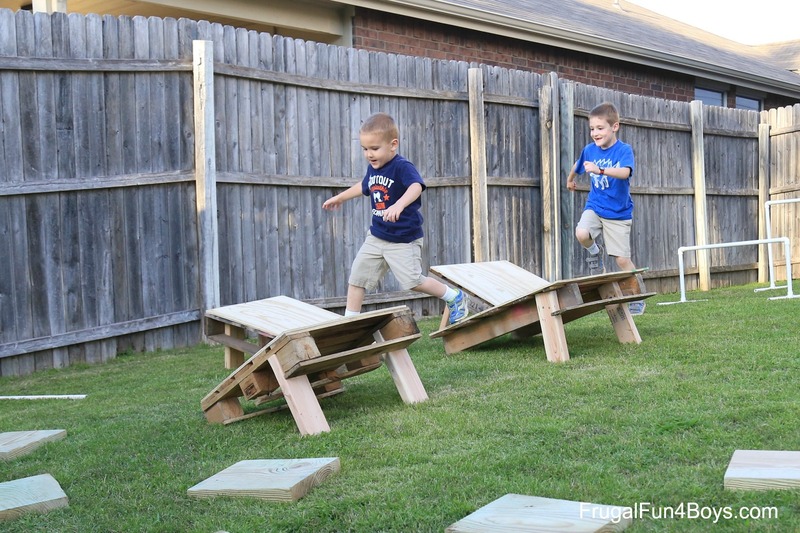 For awhile, we have been wanting to add more things to play with in the back yard. 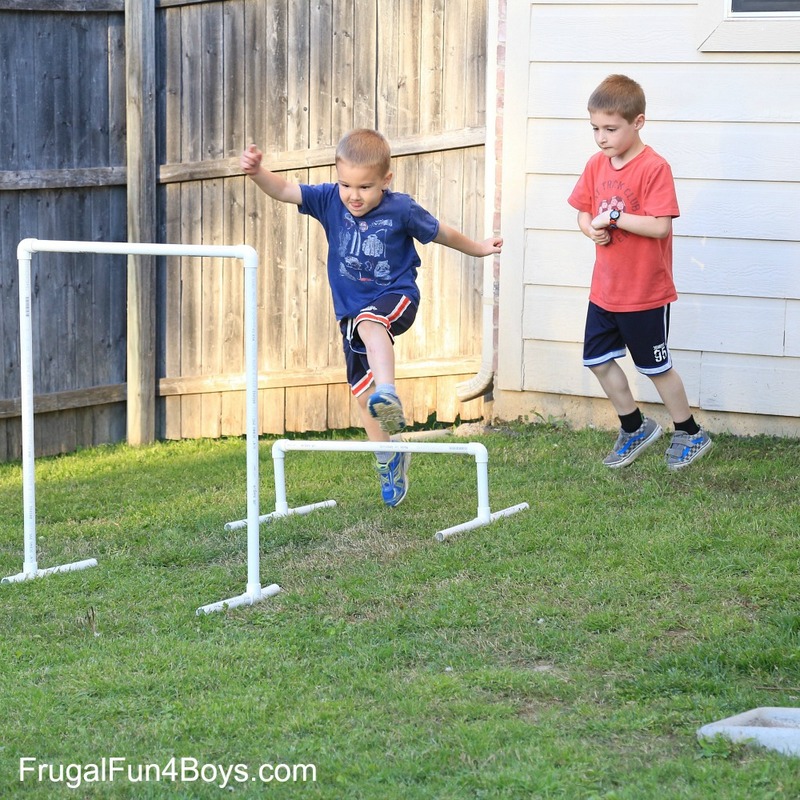 We live on a busy street, and the boys have been needing more things to do in the back yard rather than the front. However, we didn’t really want to add anything permanent to the yard. 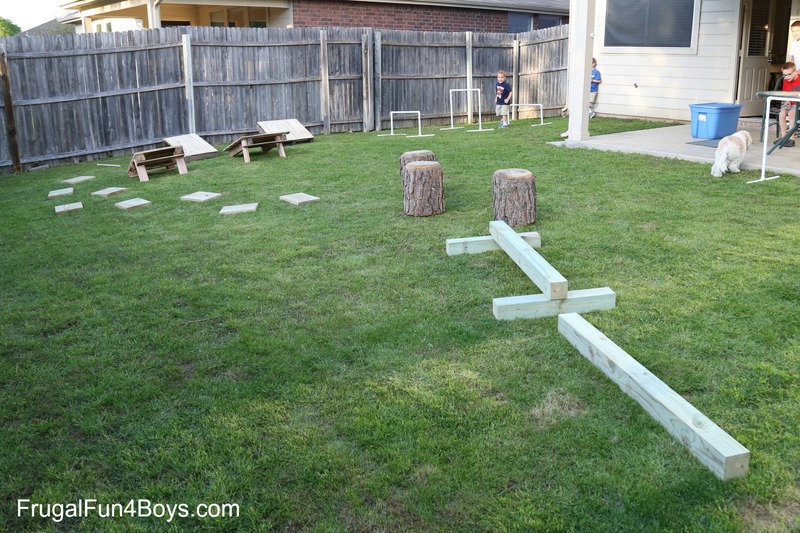 We designed an obstacle course set that the boys can set up however they want, and then it can be broken down and stored on the porch when they are finished with it. Total win. 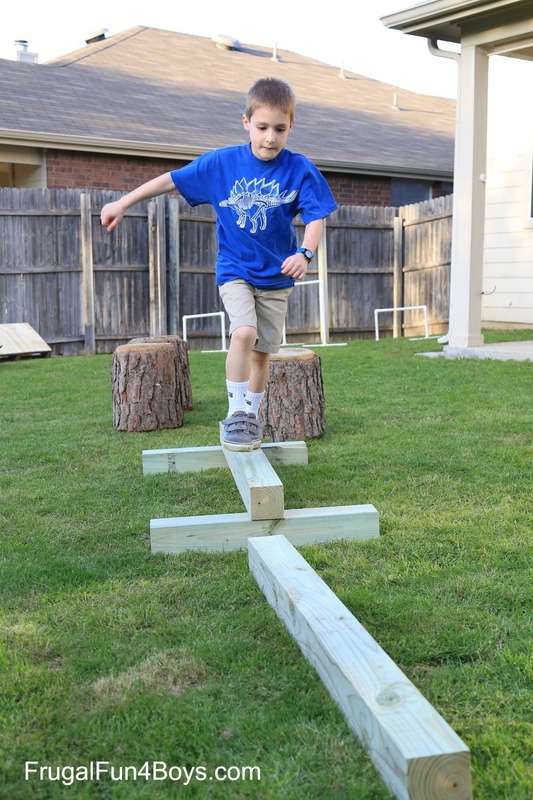 Our ninja warrior course has five basic obstacles: PVC pipe hurdles (which can also be used to crawl under), wooden stepping stones, sloped stepping stones, and balance beams. We also added three tree stumps that we happen to have on hand. These were something that we brought home when my parents had a tree professionally removed from their yard. Safety Note: There is an inherent risk in any activity like this. This is intended to be a supervised activity, with adults making sure that the elements of the course are in good condition and that the kids are using good judgment. We made the PVC hurdles out of 3/4 inch pipe. Each hurdle needs two T joints and two 90 degree elbows. If you cut some extra pipe sections, the kids can re-build the hurdles at different heights for some variety. 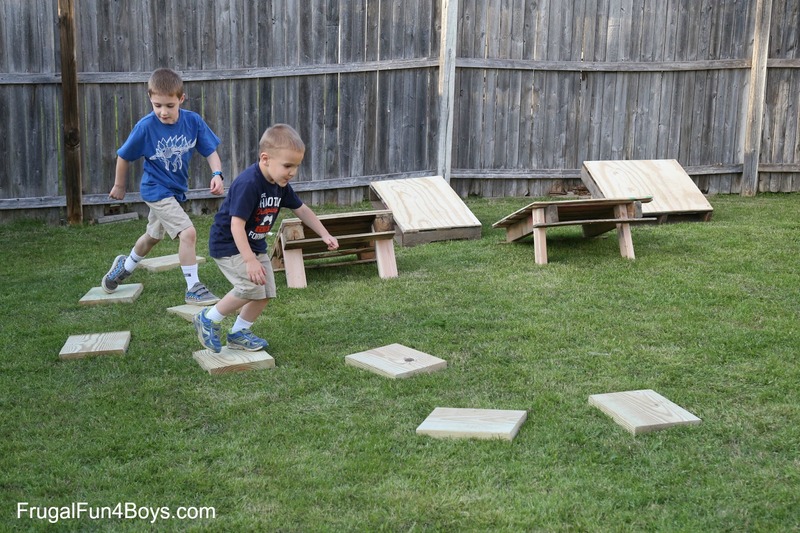 These sloped stepping stones (built out of pallets) are the kids’ favorite element! We saw this idea on Mom of 6. My husband did a little hunting on Craigslist and found someone who was giving away free pallets. The ones he got were all different sizes, so he just made it work! 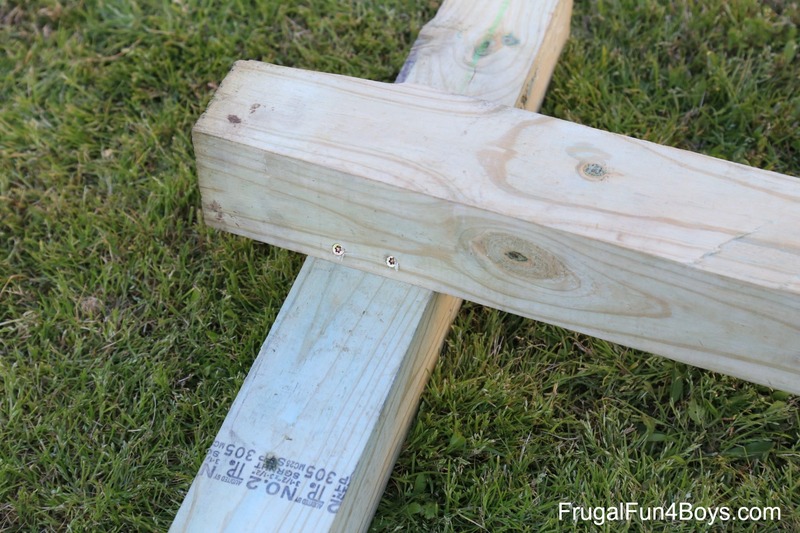 He screwed two 12 inch long 2 x 4 legs on each one. The exact placement of the 2 x 4’s was a little different on each pallet, depending on how it was constructed. Here’s a view from the underside. 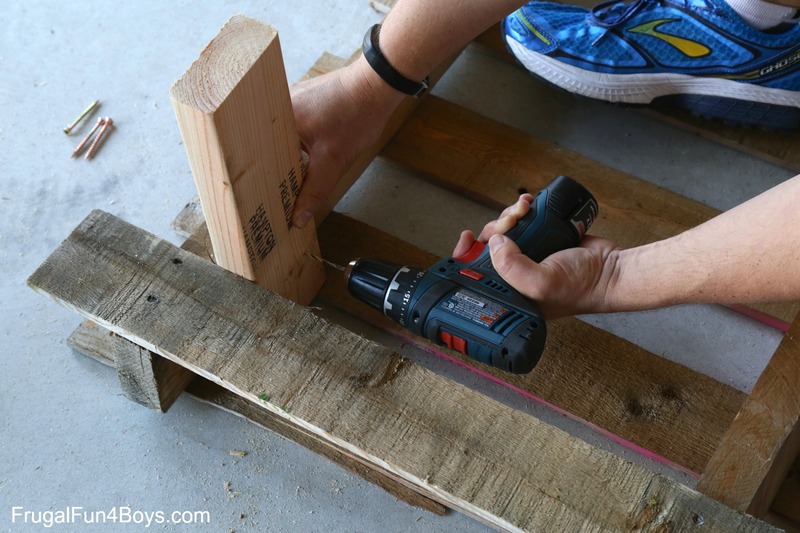 He cut a piece of plywood to fit the top of each pallet and attached it with wood screws. 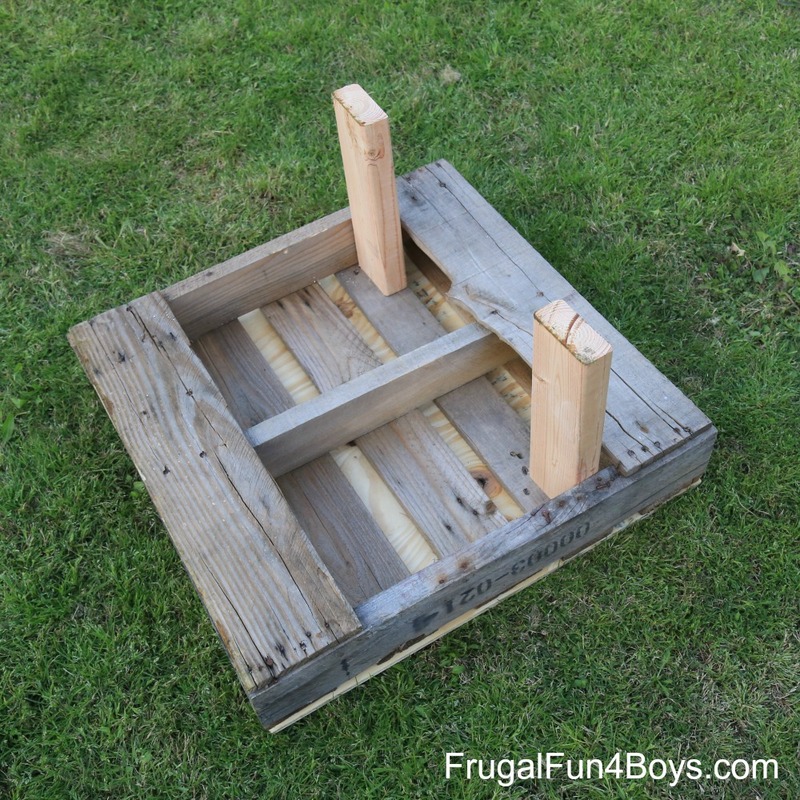 This distributes the kids’ weight when they jump on them and keeps the pallet slats from breaking. The flat stepping stones are just pressure treated wood, 12 inches wide. We cut the boards into 12 x 12 squares and sanded down the edges. Simple, and yet so fun! 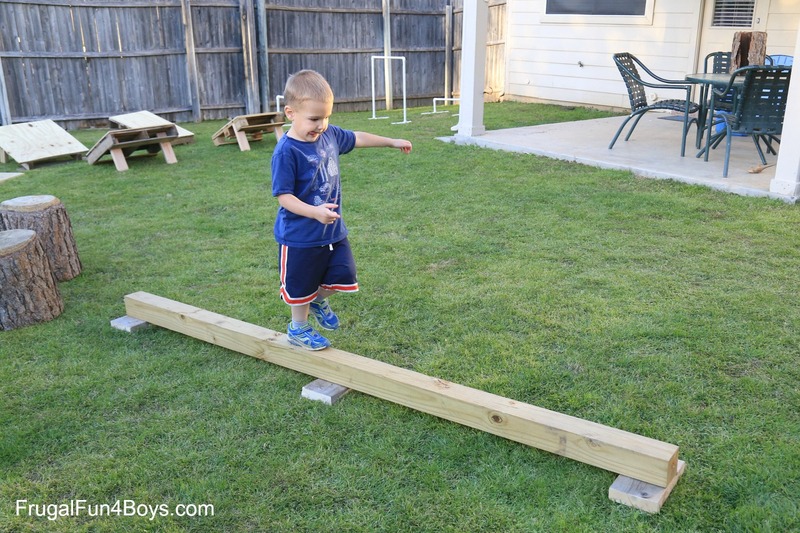 Pressure treated 4 x 4’s make great balance beams. Be careful, though – the beam placed directly on the ground is wobbly, especially for younger kids. We put in wood screws at an angle to hold this balance beam together. It’s quite stable. 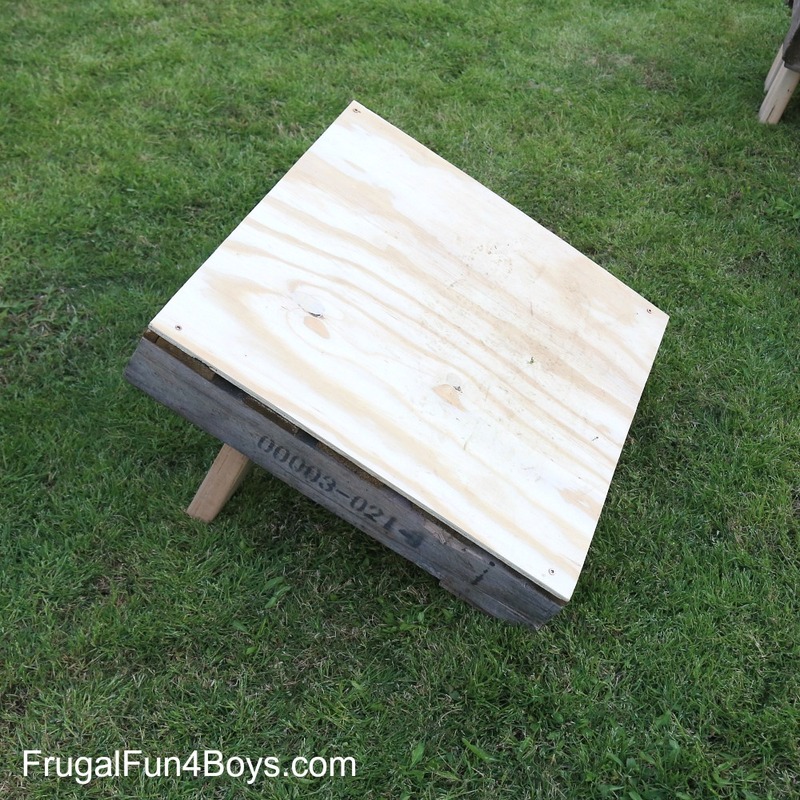 These are too wobbly for the younger boys, but the older boys have been loving them! Surprisingly, this whole set-up breaks down easily for storage. We are keeping ours on the back porch. 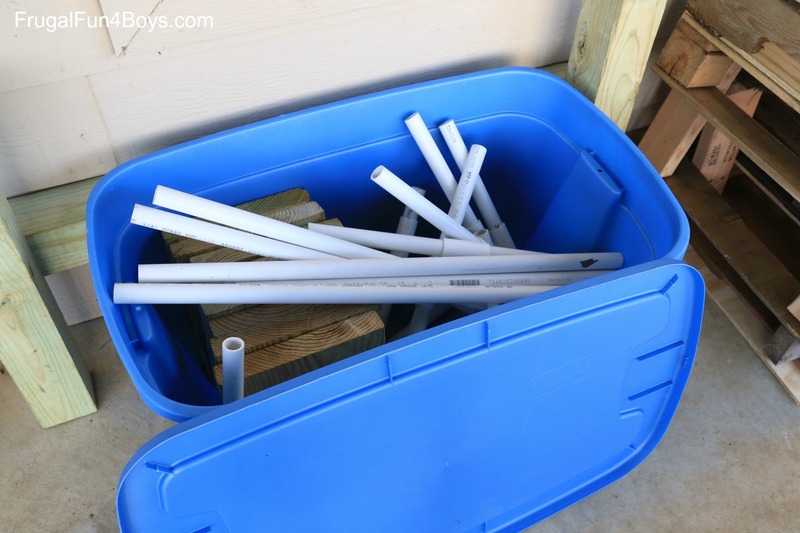 The PVC hurdles break down completely, and those pieces along with the wood stepping stones fit in this large plastic container. 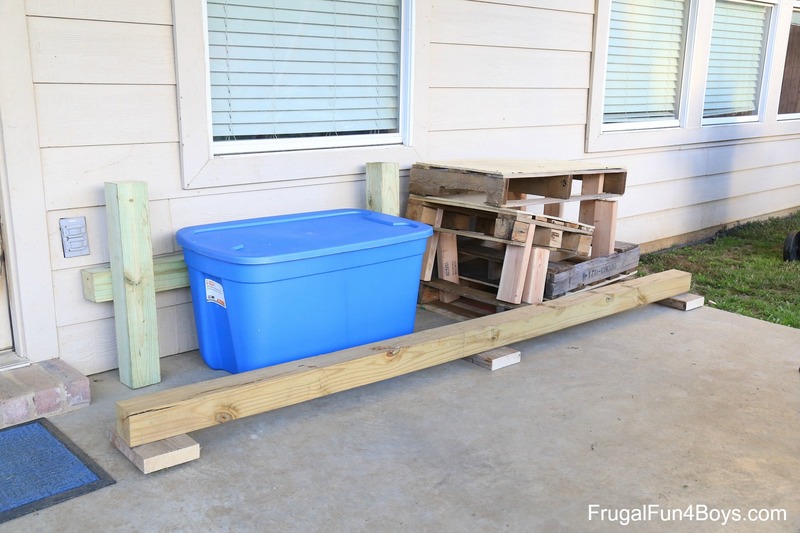 We stacked the pallets and lined up the balance beams, and the whole thing really does not take up a lot of space on the porch, considering what it is. I’m sure we won’t keep the pallets forever. They will break at some point, and then we can recycle them or put them out on the curb. 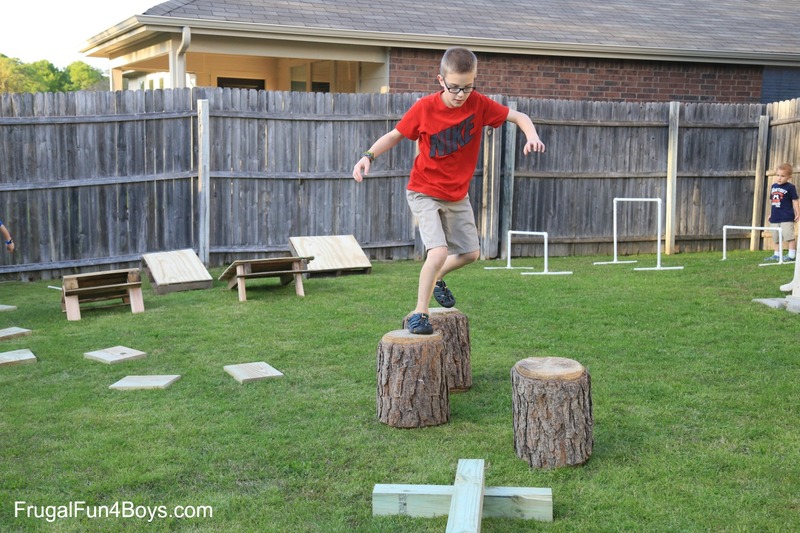 Have fun building an obstacle course!